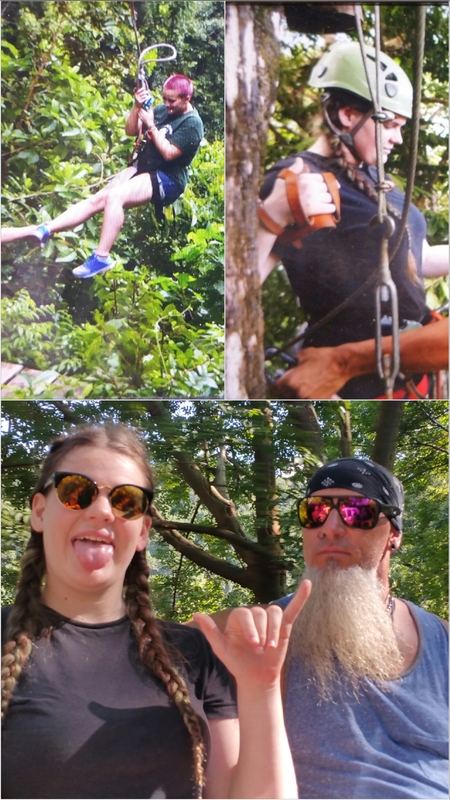 The one main thing Ava wanted to do on this trip was to go ziplining. That was an easy enough request. I have been twice before and it was always a fun adventure. A few weeks ago I made the reservations online for a Saturday morning at 8am. Figuring that would be before the afternoon rains would arrive. I was still able to rise with the sun and have an hour of quiet reflection time before waking Sean and the girls. 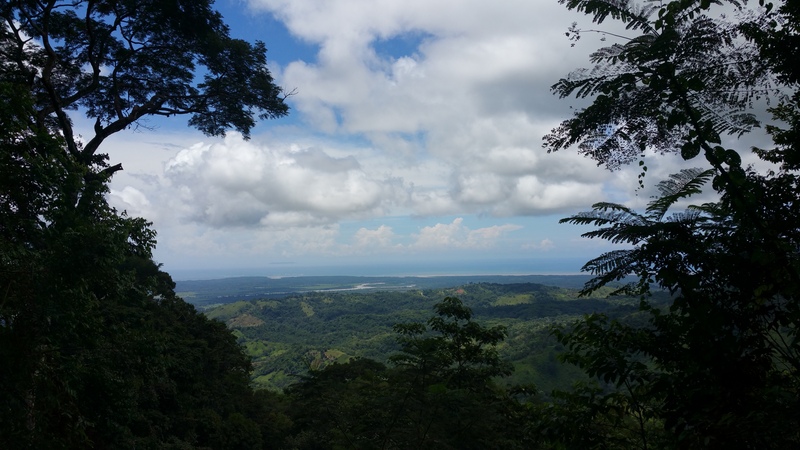 We ate granola bars and drank water as we drove south to the Osa Canopy Tour Office. I signed away waivers for all of our lives and paid for the adventure. This was the same company that we used when I went six years ago. So, yeah, just old hat for me. We were reading the posters for the adventure. 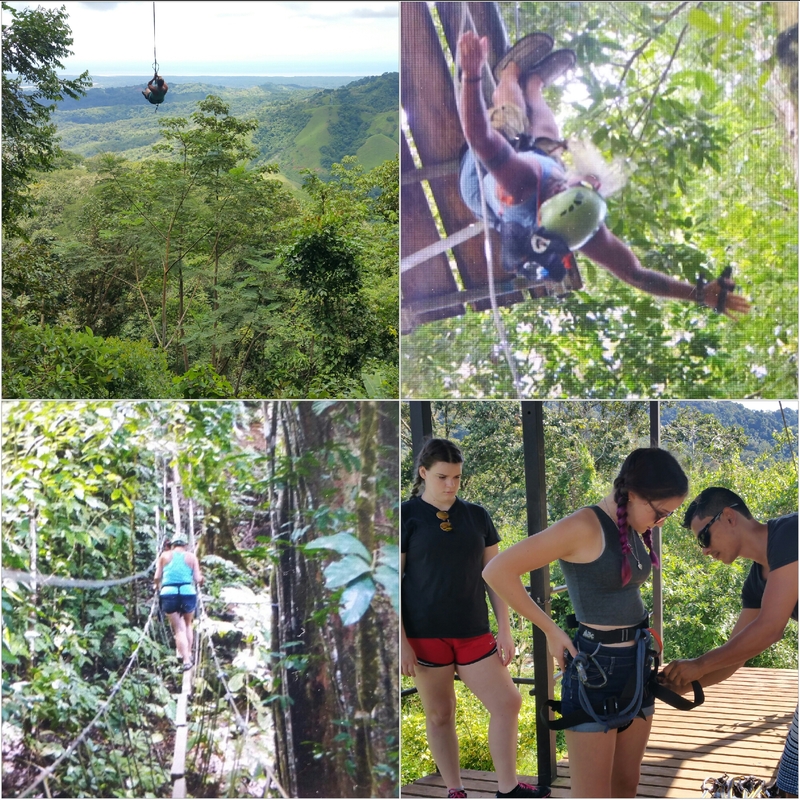 9 cables, 2 repelling stations, and 2 suspension bridges and a Tarzan swing. I didn’t remember hanging bridges from before, but no worries they just added a few things to make the trip more value added. You have to keep up with the competition everywhere ya know. We jumped onto the bench seats in the back of an open bed truck and headed down the highway turning off onto a dirt and rocky road. Bumping and jostling us back and forth. Thinking about how thankful I was to have used the restroom before getting into the truck. 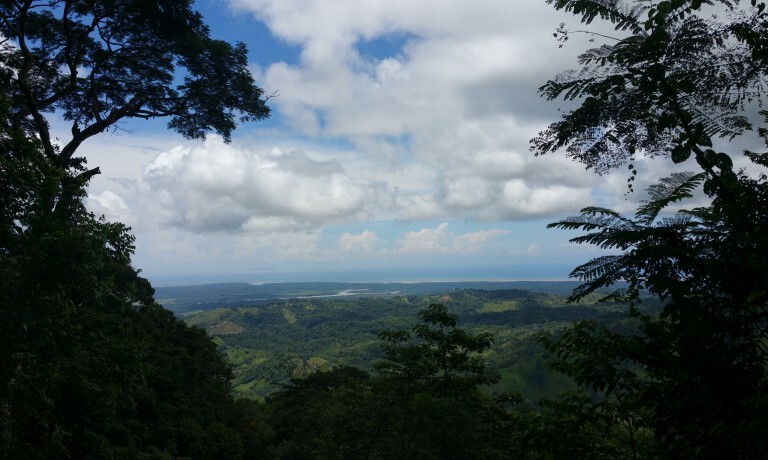 About 30 minutes later after one of the most breathtakingly stunning drives I have ever been on, we were at the top of a rainforest mountain with beauty at every turn. Our guides suited us up with harnesses and helmets as they gave us the safety talk and what to expect. Minutes later we each took turns zipping across from the first platform to the top of a tree high in the rainforest canopy. The zipline is exhilarating as you “fly” over huge spans of space with green. Technically as the rider you don’t have too much to do other than site a certain way crossing at your ankles and enjoy the ride. The last fifteen feet you follow instructions to slow down so you don’t slam into the guides as they help unhook you from the cable. The girls were doing great and we were all excited to get to the next one. These cables are hundreds of feet in the air with nothing between you and the jungle below. 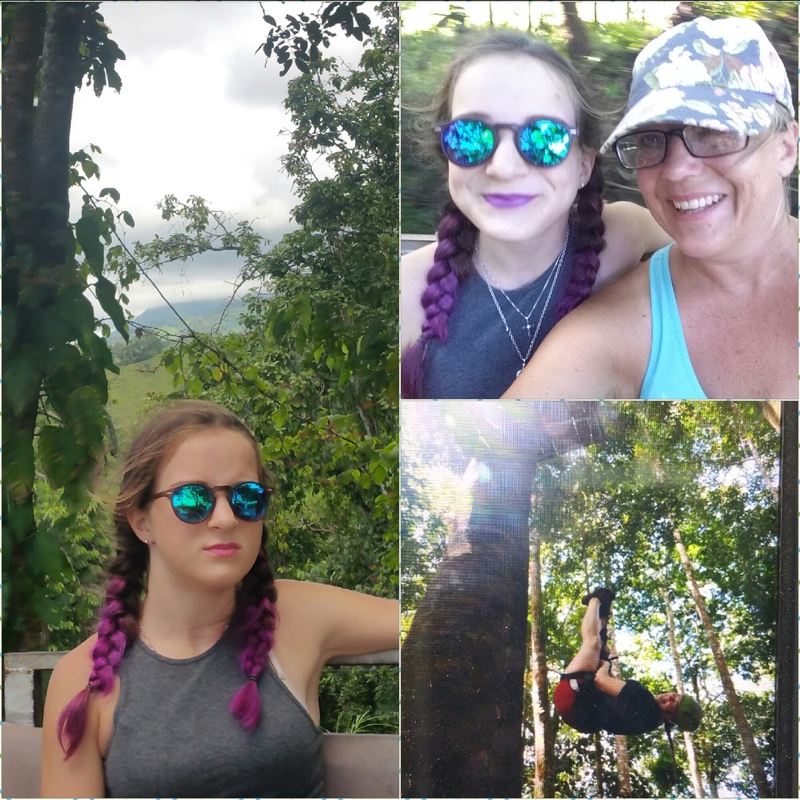 Views included waterfalls, rivers, a little village, a three toed sloth….really just amazing. We were repelling down a tree, just trusting the equipment and our guides that do this every day for a living. It didn’t take much to talk us into rappelling upside down as the guides earned our trust. Then we came to the first suspension bridge. By the time I got to the platform, the girls were already across. Hmmmm…I didn’t like the looks of doing this. But no worries, everyone else was already across. Kyleigh had been a little fearful of some of the platforms but she just jumped right in, usually the first one across. She said the anticipation was more frightening than actually doing it. I was so proud of her to just jump in and do it. I watched as the girls pranced across the bridge at quick pace, similar to a six year old playing hopscotch, selecting where to place their next step, but hopping from board to board in almost a rhythmic pattern. The bridge was swinging and bouncing as all three of them were on it at the same time. I stepped on and followed suit, although at a little slower pace. I just did it one step at a time. The six inch planks were and separated by about eight inches of space between each board. Plenty of space for my foot to slip and fall through. We were still tethered in with a safety cable, so if I slipped and fell I wouldn’t plunge to the bottom of the gorge to my death, but I would be dangling until I could be rescued. Sweating was dripping from my face…although that might have been tears, as in my mind, this was one of the most mentally terrifying things I have ever physically done. Safely making it to the other side, I let out a sigh of relief and really tried not to think about the poster that I saw in the office.. the part that said TWO suspension bridges. We continued on with more ziplines and another huge rappelling station. This tree was about a 250 ft drop from the platform to the ground. Once again, hanging upside down, completely putting trust in the equipment and our guides. It was then time for what I dreaded most. The second suspension bridge. Only this one the boards were 2 ½ inches wide by 3 feet long. They were laid out from end to end length wise. Each swinging independently of each other as they were suspended over a jungle revine. There were cables to hold onto to my left and my right. Believe me, I had a death grip on both of them. The boards were not new strong boards from the local lumber yard. These were older weathered boards, crooked and slippery with the dampness of the rainforest as green algae and mold grew on them. I let everyone go ahead of me, except Sean and our exceptional guide, Chris. Stayed behind me to coach me along. When the others were crossing, they were screwing around laughing, bouncing and shaking the boards. Before I took my first step, I began to sweat profusely, but I did control my breathing. Deep, slow and full breaths. Kind of like what I learned in Lamaze birthing classes many years ago. I even had flashbacks of giving birth to each of my kids as my self-talk mantra repeated “you can do this, you can do this” Again, I knew I wouldn’t die walking across this bridge, or if I did fall off, I wouldn’t hit the bottom and break multiple bones because I was tethered into a safety cable line. But just the thought of dangling from the bridge waiting to be rescued was more than I could even imagine. 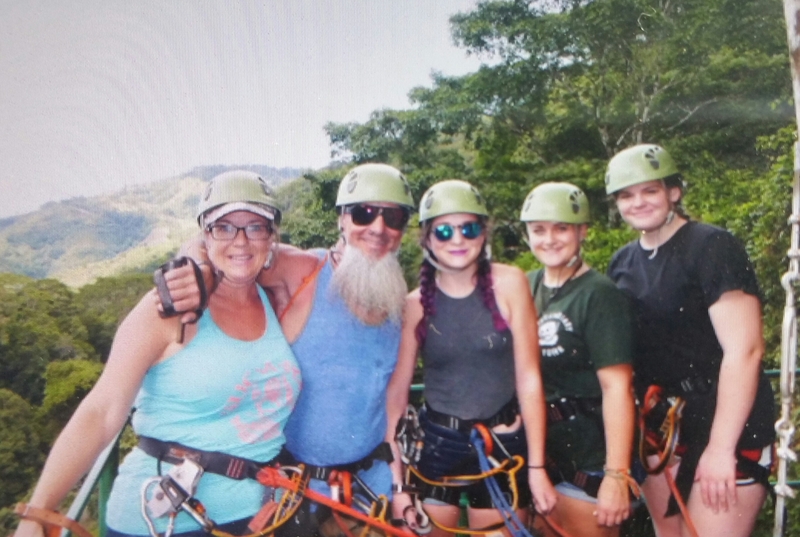 It was very different than the ziplining or the rappelling portion of the tour because with those you do with 90% of trust in the equipment and the guides and not your own abilities. But with this, only myself can take each step and traverse my body from one side of the revine to the other. In my mind I went back to when I was nine years old taking gymnastics at the community recreation center, walking on the balance beam. Heck, back then I was even doing cartwheels on it. I knew I could do this. It really is just putting one foot in front of the other. Chris began to talk to me to keep me distracted from the worry. That helped me more than he could ever know. Well maybe he dies because I’m sure I have not been the first person to freak out on these tours. He really did know what to do to keep me calm and my fears at bay. He asked me questions about my family and where we lived. He encouraged me when I had reached the halfway milestone point. The rest of the tour group waited on the other side. I thanked them all for being so patient. Chris then reminded me that I could now take walking suspension bridges off of my bucket list. Which I have promptly done. We then ended the tour with delicious fresh cut fruit and a Tarzan swing, before traversing down the mountain and back to the office. How many times do we have a fear in our life that we really didn’t know was there till you are faced with it and have no choice but to tackle it one step at a time? Even though it may require our own power and effort to take us through it, don’t ignore the encouraging voice talking you through it each step of the way. Receiving encouraging words from others is just as if not more important than the self will power to overcome the mountain of fear you are facing.